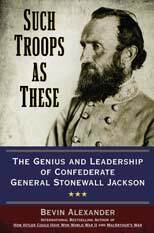 Such Troops as These: The Genius and Leadership of Confederate General Stonewall Jackson Click here to purchase from Barnes & Noble. Click here to purchase from Amazon.com. This site presents information on the immense amount of research and writings by acclaimed Military Historian Bevin Alexander. The purpose of this site is to provide historians, researchers, and students with some of the most comprehensive resources available on military history—including the Civil War, the Korean War, China, World Wars I and II, and military strategy from ancient Greece to the war on terror. Information on military history and military strategy books written by Bevin Alexander, including summaries, chapter synopses, indexes, and links to Amazon.com where you may purchase them. Excerpts from ten of Bevin Alexander's books on a variety of military-related topics and arranged in categories—Rules of War, Early Wars, Napoleonic Wars, the Civil War, World War I, World War II, the Korean War, the Cold War, and Terror & Future Wars. Commentary by Bevin Alexander on current military and foreign policy issues affecting the United States and the rest of the world. A Question & Answer section where you can submit your opinions and questions pertaining to war and foreign policy issues to Bevin Alexander, plus read Bevin's answers to selected questions by other readers. Photos and information on the Korean War and the unique Army Historical Detachments that operated along the front during that war. Information on an advanced college course on the rules of war that Bevin has been teaching at Longwood University, Farmville, Virginia, for a number of years. Browse the site's many pages by using the navigation bar located at the top of each page. If you have trouble finding what you are looking for try using the Search the Site feature in the navigation bar to enter keywords and retrieve relevant pages.